This Sofia Comforter Set is part of our newest designs from our Just Kidding collection. We make bedding fun and your child will love this exclusive design and the comforter is light, soft and warm and cozy. Love the bright colors in this. I love alot of color in my house and it is a great addition. Comforter is nice and warm so no need to worry if it's cold out. Well made. I give this item a 4 star review because the actual colors are brighter than they appear in the picture on the website. I like the material, my daughter was so excited to sleep in her new covers. 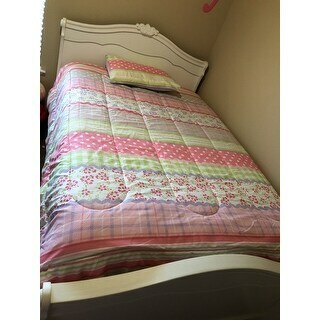 I purchased the full size and it fits my daughters bed perfectly. The description says it fits full/queen but it would be small for a queen bed in my opinion. Overall, happy with this purchase just wish that the colors were more true to the pictures. I received the comforter and pillow cases, however the pillows cases were not the same design as advertised. The comforter is beautiful! Nice comforter set. Good quality however the comforter isn’t very plush. It’s excellent for summer use but add a blanket for added warmth in the winter months. I absolutely love the print and colors! It matches my twin girls room decor effortlessly. It is well made and beautiful bedding! I would definitely recommend thgis product and thee brand! It is well worth the money. Very Pretty! Lite weight and well made. My granddaughter loves it!! I like the quality of the material. I bought these for my two grandaughtes the y absolutely loved them. I would recommend them to my friends. I like it very much...fit my bed perfectly and looks great... would definitely recommend it to others...was shipped very fast and had no issues at all... thank you for a good product. I think that maybe the quality was not so great on this. Right out of the bag I washed it and it started to unravel. very pretty but after washing it once the threading is coming out on the side..
It’s beautiful and my daughter loves it!! I love the print. I would definitely recommend to a friend. Purchased this for my 5-year-old bed it was a very nice set. Price and color combination of this comforter set was perfect. "Described as 3 piece but only details 2 pieces -comforter and sham. Also where is color description?"